Lowest prices all the time, guaranteed! If you find a better price, let us know. Providence quilt bedding by C&F Enterprises is a lovely, simple grey and white combination. The design is from the Colonial Williamsburg collection. Classic motifs are used in a contemporary way to make a clean and classic look. This bedding will fit both modern and traditional decor. Machine washable on gentle. Machine dry on low. From the Colonial Williamsburg archives of popular damask fabrics of the 18th century, comes this updated interpretation in gray and white. Cotton Filled, Prewashed, Luxury Oversized. 66" x 86". We offer the complete ensemble in the Providence pattern by C & F.
From the Colonial Williamsburg archives of popular damask fabrics of the 18th century, comes this updated interpretation in gray and white. Cotton Filled, Prewashed, Luxury Oversized. 90" x 92". Fits full and queen size mattresses. We offer the complete ensemble in the Providence pattern by C & F.
Petite gray damask medallions on white gathered split corner 18" drop bedskirt. 39" x 76". We offer the complete ensemble in the Providence pattern by C & F.
Petite gray damask medallions on white gathered split corner 18" drop bedskirt. 60" x 80". 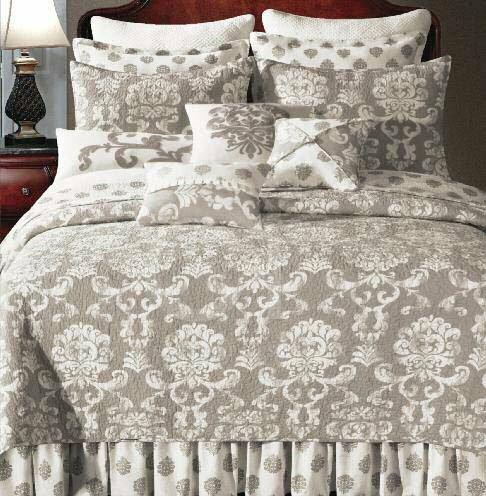 We offer the complete ensemble in the Providence pattern by C & F.
Chain stitched damask scroll. 12" x 24". We offer the complete ensemble in the Providence pattern by C & F.
From the Colonial Williamsburg archives of popular damask fabrics of the 18th century, comes this updated interpretation in gray and white. 80" x 15". Straight rod pocket valance. We offer the complete ensemble in the Providence pattern by C & F.